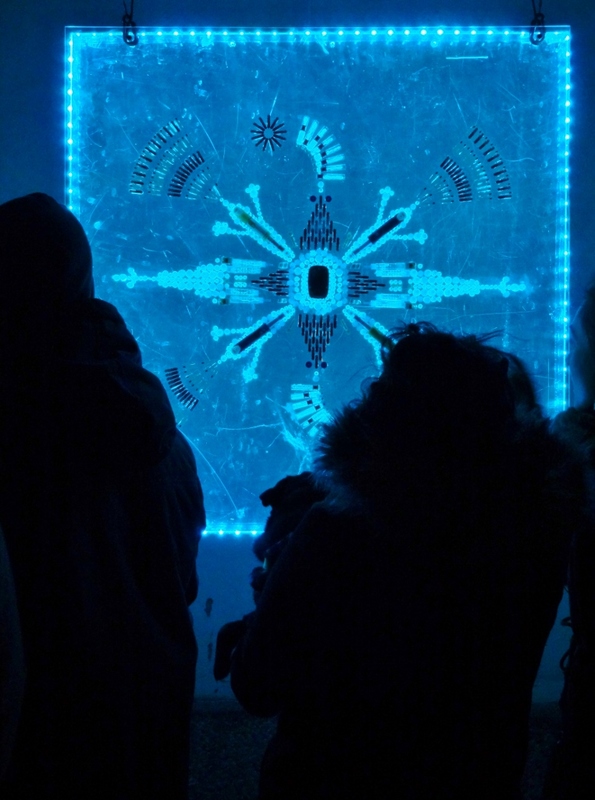 Further to the Lux Helsinki 2015 event of last week, a series of LED-illuminated Mandalas made out of medical material for diabetes were hanging in one of the inner courtyards of the National Museum. 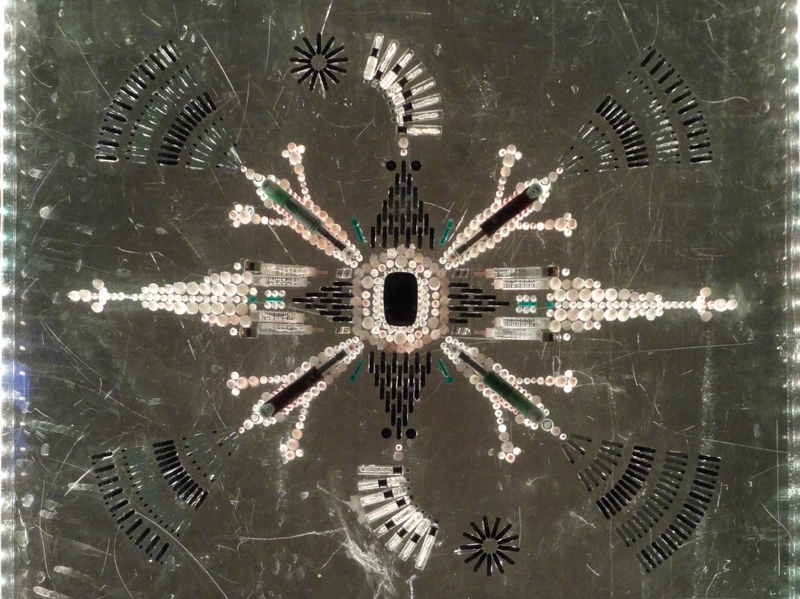 Syringes, needles, insulin pens, lancets and blood glucose test strips were arranged in symmetrical shapes between two transparent sheets making the viewer realize that something generally considered terrible or frightening can also be seen as beautiful. This series was attributed to Ishmail Sandstroem, a supposedly New York based “outsider artist with an Algerian-Swedish background”. In fact, according to the pseudonym’s creator Sandstroem is an artist collective but more precisely it is the alter ego of the Finnish artist, theatre director, and diabetic Petri Lehtinen who lived in New York for years. 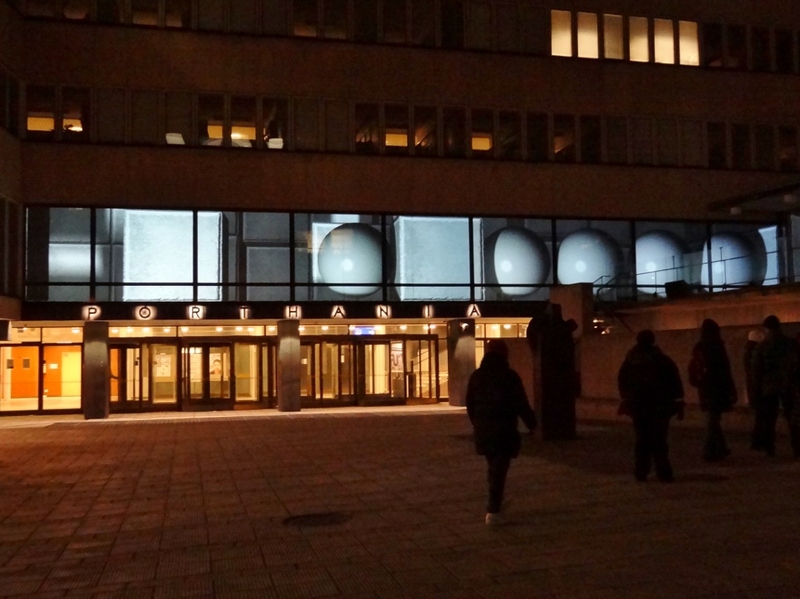 The 375th anniversary of the University of Helsinki was celebrated with a video installation by the German Mader Wiermann duo – that is media artist Holger Mader and architect Heike Wiermann – projected onto the first-floor windows of the University’s Porthania building. 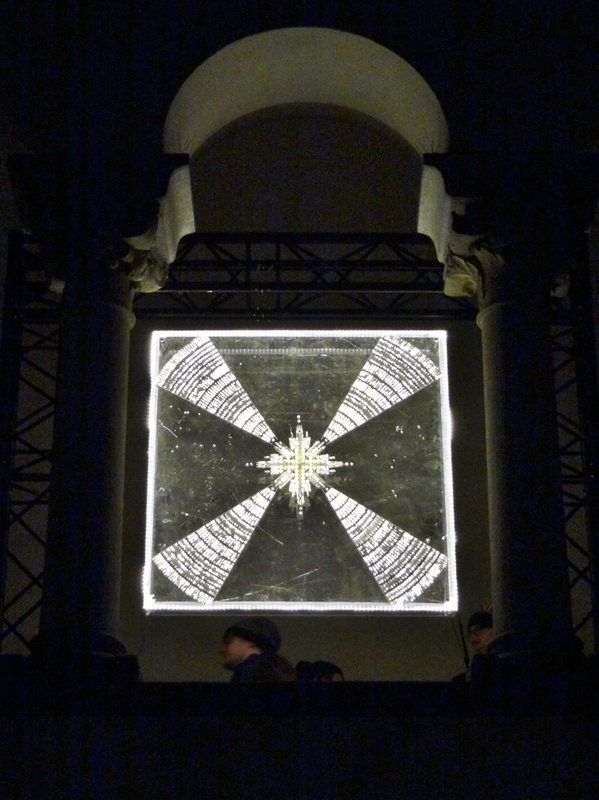 Thomas A. Troge had designed the sound installation for this piece. Below is my short video on it. I do not know the idea behind this work entitled Shift but the balls and cards being moved around or dropped out seemingly at random reminded me of cue balls in billiards and playing cards. They made me think about how much of everything in our lives actually derives from chance and coincidences. Even in matters such as choosing a profession and finding a job. I was thinking Shift could also be interpreted to describe how children or students enter the system pure and flexible and to warn how they might be hammered rigid and square only capable of filling the spot given for them in the machinery. Even if this interpretation were increasingly invalid, almost unthinkable in our country, there still are societies where such criticism would be completely relevant. 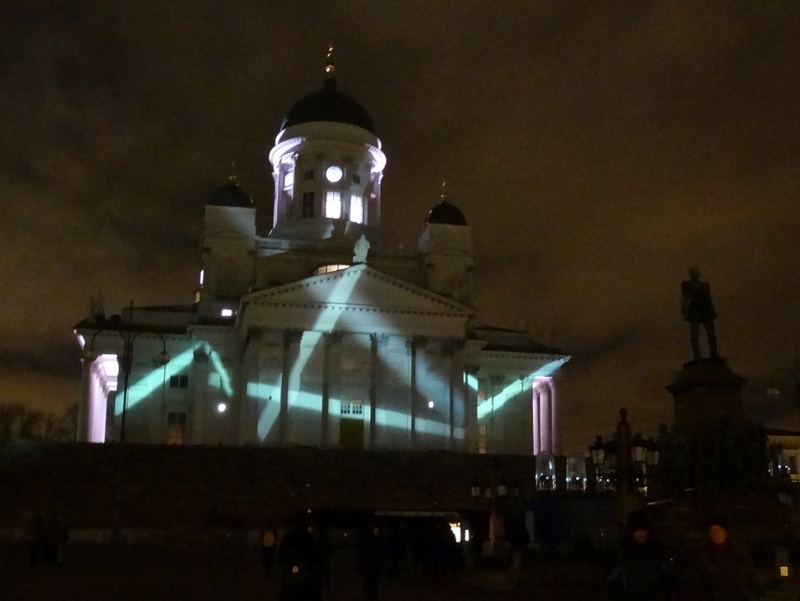 The Helsinki Cathedral was illuminated by a rare “anti-spectacle” created by Miika Riikonen. 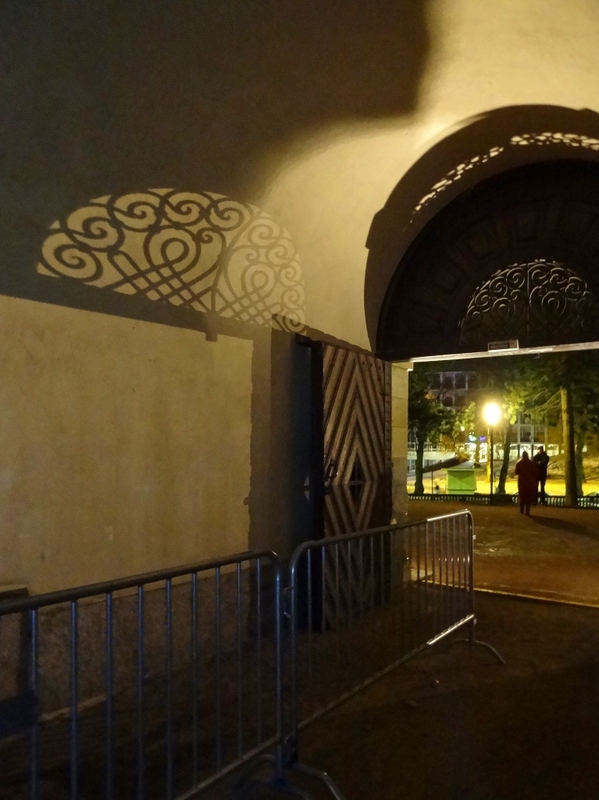 He is a local light designer who has been involved in the creation of several spectacular light installation on this location, such as the ones I posted on in connection with the 2014 and 2013 events. However, in his own work he wanted to highlight those architectural details of the Cathedral that were not part of architect Engel’s original design. This is a great idea to honour the Cathedral and the 80th anniversary of the Finnish composer Aulis Sallinen whose piece Metamorfosa Op. 34 accompanied the installation. Still, an anti-spectacle is not what you have the patience for on a freezing January evening, I’m afraid. We are all in need of Spain this time of the year. Fire Circus Walkea might have provided some warmth but as they were performing just twice each night at the Senate Square in front of the Cathedral we didn’t see their show. Anniina Veijalainen’s sculpture Camouflage, a figure wrapped in silver foil, was sitting on a bench in one of the courtyards of the Tori quarters. Despite the title, the artist doesn’t only refer to disappearing but also to reflections and eternal glow. 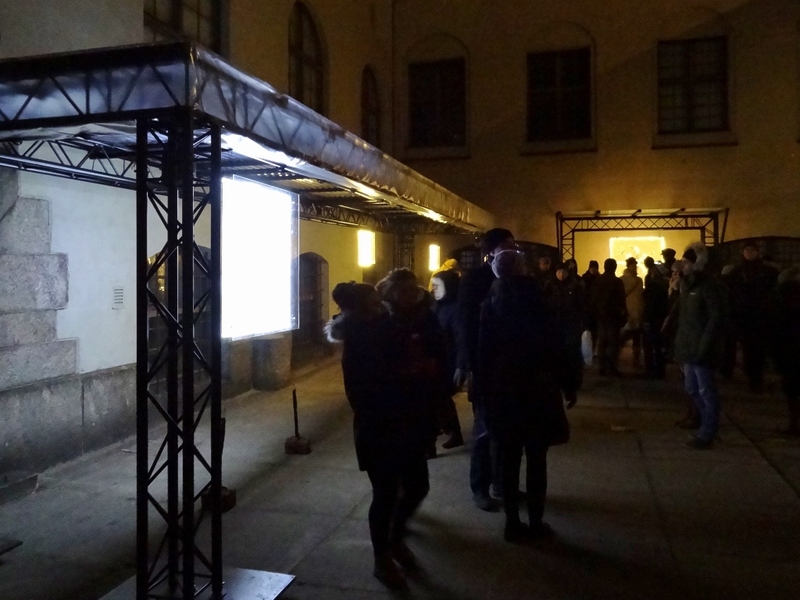 It was such a cold evening we didn’t even consider checking all the artworks but there was one we missed even if we made an effort to find it. It was Ville Mäkelä’s piece Vladimir, a rainbow flag projection with the face of our eastern neighbour’s head of state sketched onto it. The expression on his face is formed by shadows and changes as the wind ripples. This was one of the works that were already seen last season at the Cable Factory and it is even more topical now because of the 2014 happenings. I do hope it will be included also next January. Here is a link to a photo I found on Flickr. 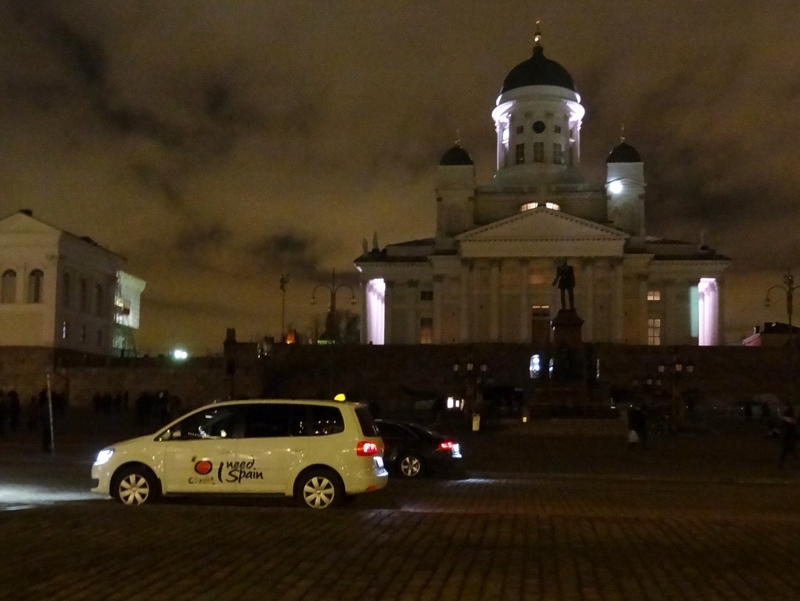 One more post on Lux Helsinki 2015 to follow so stay tuned. Entrance to the great courtyard of the National Museum.